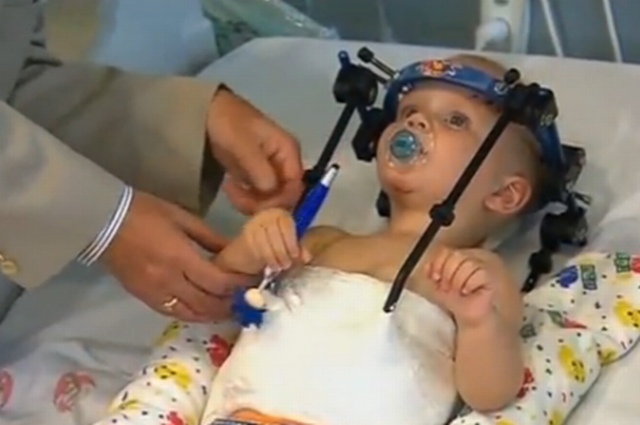 In a remarkable achievement of modern medicine, surgeons have managed to reattach the head of a toddler that became separated from his neck in a severe car accident. But before your mind begins to run away with images, this was an internal decapitation; his head was not completely separated from his body. Regardless, that should not take away from the fact that this is some surgical feat. The victim was 16-month-old Jackson Taylor who was in the car with his mother and sister when it crashed head-on with another vehicle at a staggering 110 kph (70 mph) last month. The sheer force of the impact was enough to cause his spine to detach from his head, but thankfully it didn’t kill him. After reaching the operating theatre in Brisbane, Australia, the infant underwent 6 hours of surgery during which spinal surgeon Geoff Askin innovatively used wire and a piece of the boy’s rib to graft his vertebrae back together. The toddler must now spend eight weeks in a brace, or “halo” to his family, which will keep everything in the right place and facilitate a speedy recovery. After that short stint, hopefully he will be able to lead a normal life, 7 News Melbourne reports. As you can probably imagine, this kind of injury would be fatal to many. The fact that he survived and should pull through without disability is staggering, to say the least.